Western Digital’s SanDisk division on Friday unveiled its first lineup of microSD cards that are compliant with the App Performance 2 (A2) specification. 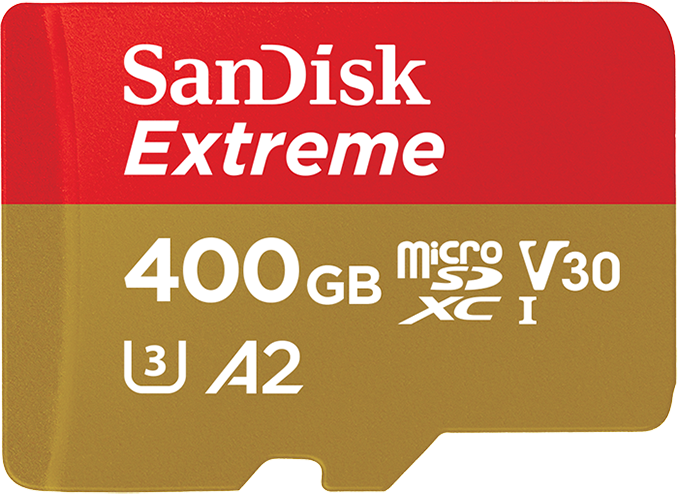 The new SanDisk Extreme cards are designed primarily for smartphones, so they do not offer very high sequential read/write speeds, yet in accordance with the A2 requirements, they offer rather high random performance for a removable memory card, making them better suited for running apps off of them. The new SanDisk Extreme microSD cards with A2 badge will be available in 32 GB, 64 GB, 128 GB, 256 GB, and 400 GB capacities. The new memory cards use the UHS-I bus and are rated for up to 90 MB/s sequential read speeds as well as up to 60 - 70 MB/s sequential write speeds, depending on the capacity (32 and 64 GB cards are a tad slower). The cards also carry the V30 badge and therefore support a minimum of 30 MB/s write speed. More importantly, in line with the A2 requirements, the new SanDisk Extreme microSD have a random performance of at least 4000 read IOPS and 2000 write IOPS (keep in mind that Western Digital does not disclose actual performance of the card, which may exceed A2 requirements). In addition to enhanced random performance (vs. 1500/500 read/write IOPS mandated by the A1), A2 cards are required to support such functions as command queuing (with a minimum depth queue of 2 and a maximum depth queue of 32) to optimize random read performance, caching to hit write performance targets, as well as self-maintenance capabilities. The SD Association’s A2 spec was designed specifically to improve performance of applications that are installed on microSD cards. In fact, the latest versions of Android only allow users to install apps on A1/A2-badged microSDs. With enhanced random read/write speeds, the new cards will be a better fit for apps that perform a lot of read/write operations and will therefore significantly improve user experience. Meanwhile, just like their predecessors available today, the new SanDisk Extreme cards are compliant with UHS Speed Class 3 and Video Speed Class 30 specs, thus providing at least 30 MB/s sequential write speed and simultaneous interleaving of eight different files, which is useful for 360° videos, or even numerous high-quality Ultra-HD still pictures taken simultaneously. To further ensure that the new SanDisk Extreme cards are suitable for photographers and drones that happen to work in rough conditions, they are designed to operate in the range between -13ºF to 185ºF (-25ºC to 85ºC). Traditionally for SanDisk Extreme microSD cards, the new products will ship with the SanDisk Memory Zone (helps to organize data on Android-based devices and effortlessly back it up to the card) and RescuePRO (simplifies recovery of files that were accidentally deleted) apps. Western Digital Japan plans to start sales of its SanDisk Extreme microSD cards with A2 badge on October 12. It is unknown when these cards hit other markets, but it is highly likely that this is going to happen shortly. Western Digital is the first company to announce its A2-compliant microSD cards officially. At least one vendor has demonstrated such cards on various occasions, but so far has neither listed them nor started their sales. They don't because of the thing they literally just fixed with this new spec. Its a shame to because so many people use microSD cards to back up photos/videos because for a non-techy its easier to backup that way vs other means. Its pretty much the go-to family asked question "I got a picture i want to save or print how do i do that". Storing in the cloud, not just backup, but actually using cloud storage as primary storage (since that's the intention for removing sd slots) is an absolute no-go for me and likely many other people. As you mentioned you need a good connection, but even with the best provider around here, the LTE connection is spotty in many places.